Butler graduate Megan Paul is in the starting lineup as a junior for the Lindenwood (Mo.) University bowling team. The Lions are currently ranked No. 2 in the nation. LINDENWOOD, Mo. — Call it culture shock, a humbling experience, whatever you like. Megan Paul isn't sure what to call how she feels about being a member of the powerful Lindenwood (Mo.) University bowling team. “It's just different,” the Butler graduate and Lindenwood junior said. Paul was a sophomore starter on the Butler High School girls bowling team that won the state championship. She won the Pennsylvania High School girls singles crown as a senior with the Golden Tornado. Now she's part of a collegiate team that has bowlers from 13 states and three foreign countries on its women's roster. Lindenwood is ranked No. 2 in the nation — trailing only Wright State — in college bowling's power points ranking system. The Lions were ranked No. 1 a week ago. “It's a pretty complicated system,” Paul said of the rankings. “They weigh strength of schedule, placings in Tier I and II tournaments and other things. While Paul was Butler's best bowler her senior year with the Tornado, she admits that “I'm just one of the crowd” at Lindenwood. “I'm averaging 181 and I'm doing OK, I'm in the starting lineup right now,” she said. “But we have a few other bowlers around 180, two bowlers averaging around 196 and another at 190. “You don't mind so much from the team perspective if you sit out a match or get beaten out for a spot, because there are plenty of bowlers on our roster who can step in and do the job. “Still, you always want to be the best. Everybody here feels that way. We push each other, we learn from each other ... We make each other better,” Paul added. Lindenwood coach Phil Vida knows he has an all-star team of bowlers on his hands because he goes out and finds them. “The biggest annual event for high school bowling is the Junior Gold tournament,” Vida said. “That moves around the country from year to year and the best youth bowlers in the nation are there, so that's where we go. Lindenwood has bowlers on its team from Mexico, Slovenia and Columbia, along with Illinois, Iowa, Missouri, Ohio, Nebraska, Florida, Maryland, Georgia, New York, Wyoming and Hawaii. Paul is the lone Pennsylvania bowler on the team. “The knowledge and experience all of these girls have ... They ask each other questions,” Vida said. “They may want to know why someone approached a particular shot the way she did or why she chose a certain ball. Paul averaged 221 through seven games in winning the state singles title in 2015. She is carrying a 4.0 grade point average while majoring in economics and finance now. Lindenwood won the 24-team Brunswick Southern Collegiate Championships — a Tier I tournament in Marietta, Ga. — and placed second in another Tier I event, the 30-team Midwest Collegiate Championships. In terms of Tier II bowling, Lindenwood won its own 7-team Lion Classic and placed second in the 39-team Leatherneck Classic. 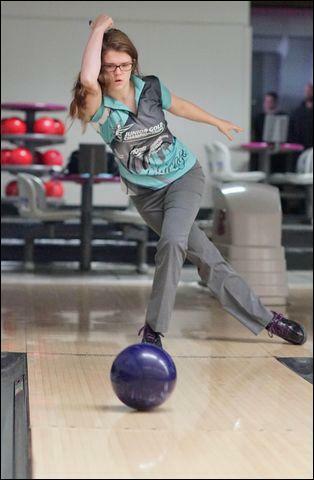 “Top collegiate level bowling is more challenging than people think,” Vida said. “Just like conditions and greens change on a golf course, oil patterns and shots change on bowling lanes.